Towcester – UK – June 2016: Engineering staff at Strainsert Inc., the USA-based premier force sensor manufacturer represented in Europe by Ixthus Instrumentation, has earned a Special Achievement award from NASA’s Capsule Parachute Assembly System (CPAS) Team for conceiving, designing and testing custom force sensors used in their successful CPAS-EDU-CDT-3-16 airdrop test. 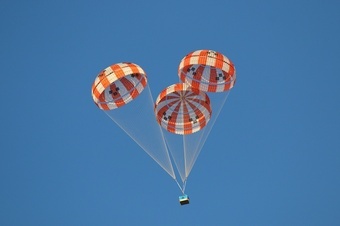 The CPAS parachutes are being developed for NASA’s Orion spacecraft programme which will send astronauts to deep space destinations beyond the moon and bring them safely back to earth. The Strainsert sensors were custom designed to collect parachute riser load measurements during engineering development for use on qualification airdrop testing, spaceflight testing and human spaceflights. This was a particularly challenging task for Strainsert’s engineering team as riser design changes from steel to a textile material required a complete revision of how the loads on drogue and main parachutes could be measured, and previous tests with COTS solutions from other suppliers had yielded unsatisfactory results. Strainsert has worked with NASA over several decades and has developed patented transducer designs for many other challenging applications on major space programs. Many of these are customised solutions made possible by an innovative internal strain gauging process where foil strain gauges are actually bonded and sealed inside small bore holes, often as part of complete load bearing components. With all sensor components enclosed inside the transducer’s metal housing, highly reliable measurement is achieved - undisturbed by external environmental conditions. One of its most notable achievements involved the supply of over forty customised sensors for NASA's Mars Science Laboratory mission which recently and successfully landed the Mars Rover Curiosity on the Red Planet. Strainsert's standard and customised load cells, load pins and force sensors are used for many other demanding applications in research, testing, weighing and control in the aerospace, military, marine and automotive industries. Ixthus Instrumentation Limited works closely as a distribution partner with Strainsert and other globally recognised producers and innovators of state-of-the-art sensor technologies for position, displacement, pressure, force, torque, vibration and temperature. Through its in-house ability to design and build customised test and measurement systems, Ixthus prides itself on an ‘engineer to engineer’ approach in resolving challenging sensor and measurement applications across industry and research.